August Jacob Patzki (= Patz) was born on January 23, 1891, in Buffalo, NY. He was baptized on February 1, 1891, by Father Ferdinand Kolb, of Saint Boniface R.C. Church, 124 Locust Street, Buffalo. His baptismal sponsors were August Schlia/Schlee and Rosalia Schwertfeger/Schwert. August apparently died in infancy. Per the clerks at Buffalo City Hall, there were no laws on the books requiring the registering of any births or deaths in the State of New York until 1914, and so they have no birth or death record on August. Nor does the United German and French Cemetery (Pine Hill), a cemetery that was used by most of the Patzes and Schwerts, have any records. The only other proof of August's existence was the 1900 U.S. Census that shows John and Mary had seven children at the time with four still living. John Martin Patz: Born 1863; died 1933. Mary (née Schwertfeger / Schwert) Patz: Born 1867; died 1940. Baptismal Record: August Jacob Patzki, born on January 23, 1891. Baptized by Fr. Ferdinand Kolb of Saint Boniface R.C. Church, Mulberry Street, Buffalo, NY, on February 1, 1891. Sponsors were August Schlia (= Schlee) and Rosalia Schwert (= Schwertfeger). 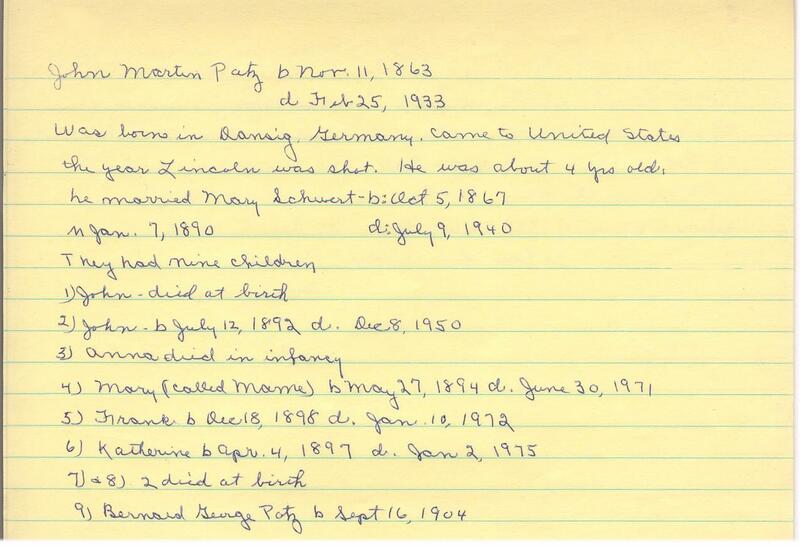 Family History Notes: Notes by Lorissa (née Lander) Patz on the Patz family history. 1900 Census Records: John and Mary Patz, with children John, Mary, Katherine, and Frank, 152 Orange Street, 16th Census Ward, Buffalo, New York.